I’ve been on a hunt to discover something akin to the Portuguese bread made by Something Natural in the 1980s on Nantucket, before they ramped up production volume and hurt flavor along the way. As I’ve experimented, I’ve made some nice discoveries. The closest I’ve come to the original flavor so far is a loaf using extra light olive oil (I’ve found this to taste a bit better than other variations of olive oil). However, yesterday I made a wonderful discovery when I tried adding dried/powdered milk. Stir the yeast, dried milk and salt into the bread flour in a big bowl and then mix in about 3/4 of the water. Then mix in the olive oil, and finally continue adding water until you have a nice sticky dough. Use a bit of oil to slick a work surface and place the dough there. Pat it down into a flattish, oval shape. There is a two-step kneading process. First, you’ll cut the dough. With a 6″ bread scraper (or a 6″ putty knife), cut into the dough at a 45 degree angle, essentially chopping it into pieces about an inch apart. For your mound of dough, you might cut it 5 to 7 times. Then push the dough together, turn 90 degrees, and repeat the process. Continue this process for 4 minutes. Next, there’s a kneading technique I like for wet, sticky dough where you really just use your fingers and fingertips rather than your whole hand. Form the dough into a mound. Grab the edge of the mound furthest away from you. Flip the dough over so what was the top now slaps into the working surface. As you do that, stretch it towards you, and then fold the dough away from you, reforming a mound. Continue with this technique, occasionally forming the dough back together with the bread scraper. Knead for 10 minutes. Clean out your bowl, dry it and oil the bowl with a bit of olive oil. Put the dough into the bowl, cover with plastic wrap, and let it rest for 2-3 hours. You can punch it down and let it rise again or move onto the next step. Toss some flour on your work surface and gently move the dough onto the work surface, lightly rolling in the flour so it doesn’t stick. With your bread scraper, cut the dough in half. Form each one into either a ball and/or an oval, cover each with a towel or plastic wrap, and let rest for 20-30 minutes while you pre-heat your oven to 400F degrees. 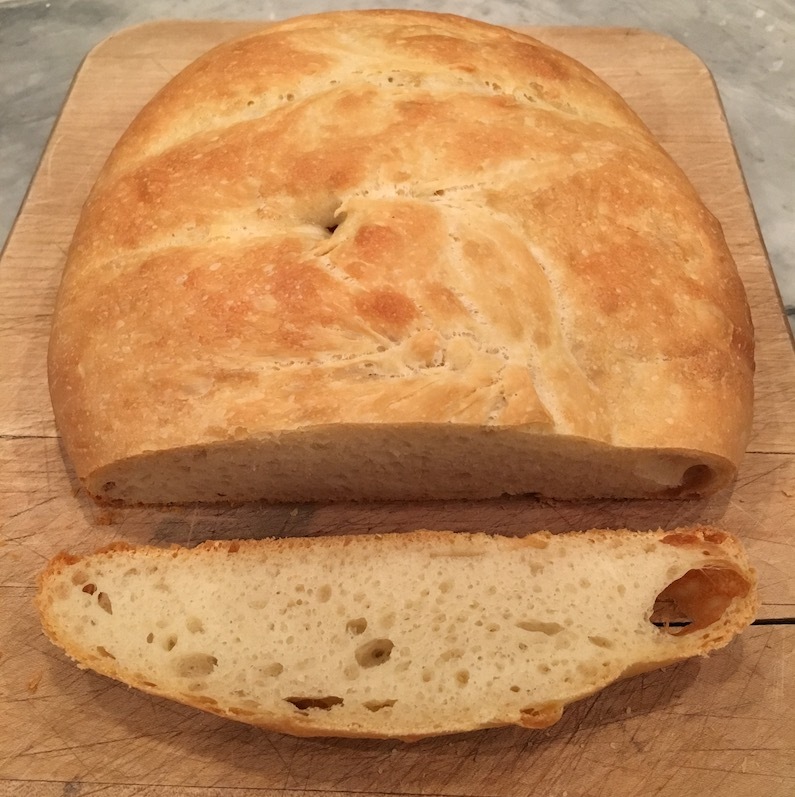 I cook this bread on parchment paper that I slide onto a baking stone using a peel, but you can also just put it on an upside-down baking tray (on parchment paper). Cook for 30 minutes or so, until the inside reads 205F with an instant read thermometer. Once done, let cool on a rack for 30 minutes. 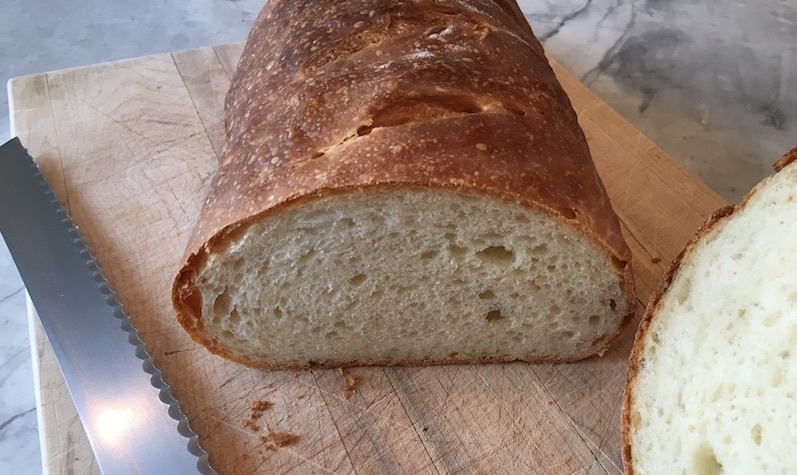 The addition of the dried milk adds a wonderful softness to the flavor, and the crust browns much more (the top photo is the loaf with powdered milk, while the below excludes it). If you leave out the dried milk, the olive oil comes through even more for a great rustic flavor. It’s really important to begin with a sticky dough, otherwise the bread gets too dense.